The Best of Bush & Bay Living ! 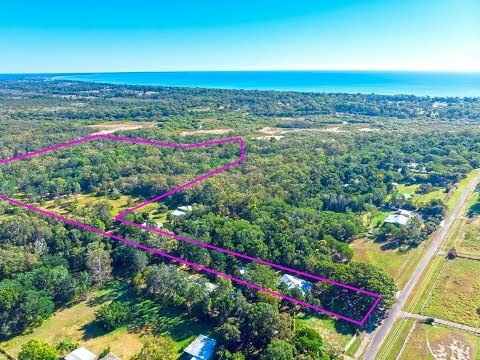 Tucked away in the Hervey Bay Northern beaches suburb of Craignish you will find this sprawling acreage property with direct access to O’Regan Creek at the rear where you will enjoy fishing, prawning and crabbing – or even heading out to the bay on a high tide! With 9.9Ha or just over 24 acres this property offers the ultimate rural lifestyle and will be ideal for those with hoses or even looking to run some stock. This property has been well cared for and offers 4 fenced paddocks and a dam. The charming two-story Queenslander has been renovated throughout and includes wide verandas on 3 side’s where you will be able to sit back and soak up the lifestyle and ambience that only acreage living provides. Downstairs is ideally set up for those looking to run a home-based business and offers the potential for dual living which will be perfect for those having teenagers or extended family living with them. You won’t believe you can have the lifestyle of acreage living with the convenience of being only a short drive away from the thriving heart of the Hervey Bay central business district and key amenities including the Stockland shopping centre, a number of schools, university, medical centres, hospitals and much more. The owners are calling for an immediate sale with all offers to be presented and they would also consider a local property swap by negotiation if suitable – so here is your opportunity! Contact our team now to arrange your private inspection as you will only be disappointed if you miss this one ….